This is our final post in our series on scrapbooking and what you can do to embellish your scrapbook pages and make them works of art. We have emphasized printable alphabets because that’s what WE like. :-) And the one to the left is one of our favs … it’s woven. 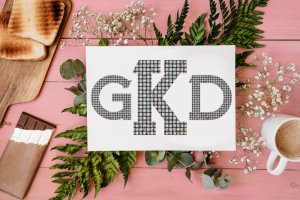 If you want an alphabet that’s truly unusual, click on the link above and see a closeup of the woven silver letters – and then use them on some of your scrapbook pages. You won’t be sorry! If you enjoy sewing and embroidery, you can use these skills to create amazing embellishments. These designs create great focus pieces for elegant gift scrapbooks. Patterns can be either sewn directly into the scrapbook page or onto a piece of fabric. This fabric can then either be used as a background or pasted on the page. 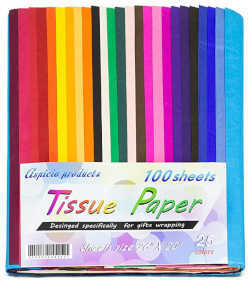 Painted tissue paper can add a colorful flair to your children’s artwork or scrapbook page. 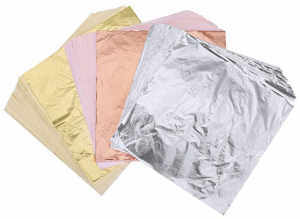 To paint tissue paper, punch or tear bits of tissue paper into various shapes. Next, using watercolor pencils and a wet paintbrush thoroughly coat the tissue paper. Then, dip the painted tissue paper in a mixture of Scrappy Glue and water and place it on white cardstock. Let the pieces dry completely. Use the dry colored tissue paper as a background, a border, or as a fancy embellishment. Faux painting can be created primarily with various colored sheets of paper. This can be used to add color and a dramatic flare to a dull scrapbook page. Creating this effect is easy. Basically, tear the edges of three papers (a dark, a light, and a medium shade of the same color). Your middle shade of paper will be the base for your design, while the darker shade will be used as the shadow. Lighter shades act as highlights. To give a chalked accent to your items without the mess of the chalk, print images directly onto vellum. Next, color the back of the vellum with a marker. When you cut the letters out and turn them over, the letters have a very pretty, muted, chalk-like appearance. This appearance creates a softening effect to loud scrapbook pages or adds an air of freedom and peace to an outdoorsy themed scrapbook. To give a metal look to your scrapbook page, print the items directly onto vellum. Color the back of the vellum with a soft color of ink. Emboss clear. Repeat this process until the vellum has a shiny look. This appearance creates a hardening or masculine effect to scrapbook pages. It may also be used to highlight a mechanical or metal working theme. Get the rusted metal look without the rusted metal. Coat a red or burgundy colored cardstock with brown chalk. Next, add tan chalk for a powdery finish. Then, using a sponge-tip applicator, apply bronze or rusty color metallic rub on. Finally, add black and tan chalk on top of the rub on to shadow and highlight the item. Frosting adds a unique tough to all of your metal charms. This creates a softened look suitable for baby and grandparent scrapbooks. To create this frosted charm look, sprinkle embossing powder and glitter on the metal charms and heat. Repeat this process again, before the item has a chance to cool. Attach the charms to your scrapbook once they cool completely. Typewriter keys add a learned look to a scrapbook page. Typewriter keys create an added personal touch to scrapbooks for secretaries, writers, and students. Unfortunately, typewriter keys are very expensive to buy. The alternative is to make faux typewriter keys. To make faux typewriter keys, stamp a letter onto your background. Next, set a circle concho over the letters. Then, fill the concho with diamond glaze. Once this hardens it will look just like a typewriter key. We were unfamiliar with diamond glaze until we learned about scrapbooking embellishments using it. It’s an interesting product … the directions on the bottle say, “Use directly over artwork for a raised glass-like finish or as a dimensional glue for glitter, beads, glass, metal, plastic and paper”. This is very versatile! ABC beads look great on children’s artwork and baby scrapbooks. Now you can make faux beads too. Simply print out your word in a large straight font, with several spaces between each letter. Next, use a hole punch to punch out each individual letter. Then, peel one side of a piece of wax paper using a glue dot. Stick your circle with the letter on it to the top of this waxed dot. Once set, simply string the beads together with thread, wire, or embroidery cotton. Glass marbles add a unique magnifying effect to letters or photographs under them. This is a great elegant touch for favorite relatives or gift scrapbooks. Glass marbles can also be used to create artistic children’s art and scientific looking scrapbooks for young scientists. To create this look, you will need glass marbles with one flat side. Alternately, you will have to cut your glass marbles in half (which sounds almost impossible to us?) Then, paste these marbles, using clear drying glue, on top of writing or an embellishment that you want magnified. 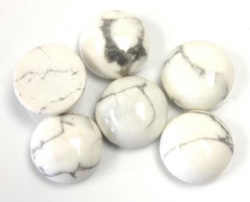 There are lots of flat-backed marbles on sites like Amazon that are suitable for this interesting effect. We especially like the ones pictured to the left. Wax paper ink dye has an effect resembling tie-dye. This creates a great children’s art background or a funky scrapbook for a close friend. To do the wax paper technique cut a piece of wax paper slightly larger that the area you are working with. Next, crumple the wax paper up and then unfold. Then, lay the wax paper onto the glossy paper and cover the wax paper with a sheet of paper. Iron the papers, using the hottest setting, for no more than 5 seconds. Peel off the wax paper and then apply dye ink. The wax acts as a resistant to the ink forming a textured look. Embossed foil creates unique elegant accents and highlights on photographs. This adds a touch of age and antique-like look to scrapbook pages. To make embossed foil, place a piece of carbon paper on top of the foil. Next, place a picture on top of the foil. Then, trace around the picture using an embossing tool. You can also use a rubber stamp. Ready made embossed foil is also available at your local craft store. Beautiful silver, gold, rose gold and copper metallic accents make a wonderful touch to lettering or tags on your scrapbook page. This is a very elegant touch on gift scrapbooks or invitations. To make these accents, stamp a piece of vellum with embossing ink and heat and stick powder. Next, heat the item. Then, using a small paintbrush, paint this piece of vellum with gold (or other color) leaf. Brush off the excess powder with a brush. And speaking of rose gold – here is one of our all-time favorite printable alphabets, definitely suitable for scrapbooking. It’s a rose gold, art deco alphabet that would absolutely wonder with these metallic accents. You can see how glittery it is and how well it would match the rose gold sheet pictured on the right. 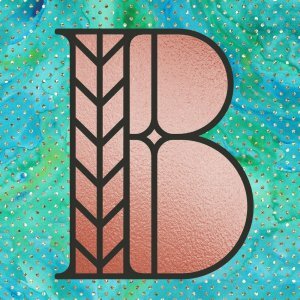 Copper, tarnish or untarnished, adds a unique metallic look to your scrapbook page. Furthermore, copper is fairly easy to work with and cut into various shapes. In this way, copper can be used to create an elegant antique look or a more masculine look. You can tarnish copper tooling foil by either heating it. This gives the copper red, orange, and purple tones. Alternately, you can use Liver of Sulpher to make the copper look old and blackened. Tarnish can be easily removed by rubbing Tabasco sauce on the tarnish. Fabric flowers make great embellishments on scrapbook pages. Unlike plastic flowers, fabric flowers look more realistic. 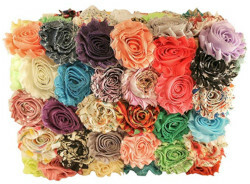 Further, unlike real flowers, fabric flowers have a long life span and they can be purchased very inexpensively on Amazon and other such sites. The flowers are made with fabric and wire and will last a very long time indeed. If you want to make your own, begin by making a wire loop. This will be one petal. Next, apply glue to the petal, and place fabric on top. Alternately, stretch a piece of an old nylon over the loop and secure with tape. Continue making loops until you have enough to make a flower. Then, twist the wires together. Fold out your flower and secure to your scrapbook page. Leis can be used to make fancy three-dimensional borders. Leis add an exotic touch to holiday scrapbooks. A traditional Lei is made using paper orchids, roses, rounded mums, and cup and saucer flowers with punched shapes and then gluing them together. To add a richer texture, cut these follows from velveteen paper. You can use ready-made leis or make your own. A beaded Lei is made by stringing large and small beads onto a string of embroidery cotton. Small yellow flowers and red berries can be added to create an even greater effect. You can use ready-made leis or make your own. Gluing shells together and placing them directly on the scrapbook page makes a shell Lei. You can use ready-made leis or make your own. To create great three-dimensional items of any shape and size use polymer molds. Polymer molds can be used to make virtually any shape. These shapes can range from animals and characters for children’s artwork or elegant bells for weddings or wedding showers. To make shapes, polymer clay is placed into molds and baked. Alternately, shape the clay into beads or other freehand items that can also be baked. Once set, these items can be painted with acrylic paint. The sweetest accents to a child’s scrapbook page are handprints. Handprints are especially appreciated in baby or grandparent scrapbooks. To make prints, prepare a flat surface. Next, put acrylic paint into a paper plate. Then, have your child place his or her hands in the paint and then on your scrapbook surface, one at a time. After the paint dries, you will have a permanent record of your child’s handprints. Stained glass mosaics are an elegant, regal touch to any scrapbook page. Stained glass is especially pretty in the most formal or heavily religiously themed scrapbooks. Well, there you have it – 106 ideas for embellishments to glamorize your scrapbook and make scrapbooking a creative joy. But are these all the choices available to the determined scrapbooker? Absolutely not! Not only are there other ideas but, with the exploding popularity of making scrapbooks, new products appear constantly. We just hope we have given you plenty of ideas to get start. So have a great time and create your works of art that will be valued for many generations.